Dimensional weight pricing (DIM) is a technique that enables freight carriers to charge shipping fees based on the size of the box, rather than its actual weight. Charging fees by weight ignores the impact of packages that are lighter in weight but bigger in size. Packages such as these take up more space on the shipping vessel or the delivery truck. In this post, we’ll take a closer look at DIM weight pricing and explain how to accurately calculate DIM weight. What Is Dimensional Weight Pricing? It’s no surprise that carriers have limited space in shipping containers and delivery trucks. DIM helps them maximize the shipping fees charged on a package by calculating the area it occupies rather than its actual weight. In this way, a lightweight box doesn’t imply a lower shipping rate (and neither does a small heavy box). Think of it this way: a lightweight but large box containing lampshades shouldn’t have significantly lower shipping charges than a small but heavy box containing fitness equipment. For this reason, many commercial freight carriers – including shipping vessels and delivery truck services – employ DIM as their pricing model. Calculating the shipping fees on your package will depend on the freight carrier (e.g., UPS, FedEx) you use and the shipping destination. In most cases, the DIM weight and the actual weight of the same package are different. Most freight carriers charge the higher of the two. You can calculate the dimensional weight of a package by multiplying its length and width times its height. Next, divide the product of the three dimensions by a dimensional factor. The resulting value will be the volume of a package allowed by the carrier per unit of weight. If you’re shipping a package that is 20-inches x 12-inches x 12-inches, and its weight is 12 pounds, the FedEx standard ground rate to deliver that package from Boston to Chicago will be $20.08. So, the total shipping cost will be $28.22, which is a 28.8 percent higher shipping fee charged for the same package. Pro Tip: Freight carriers often change the DIM factor annually which is why it’s important that you check with your carrier before sending out any packages. DIM pricing offers several benefits and incentives to freight carriers. The most notable advantage is that it allows them to factor volume-based pricing into their shipping operations. Doing so maximizes the revenue earned from the space that’s available on trucks and shipping containers and reduces the cost incurred on completing the deliveries (for example fuel costs). 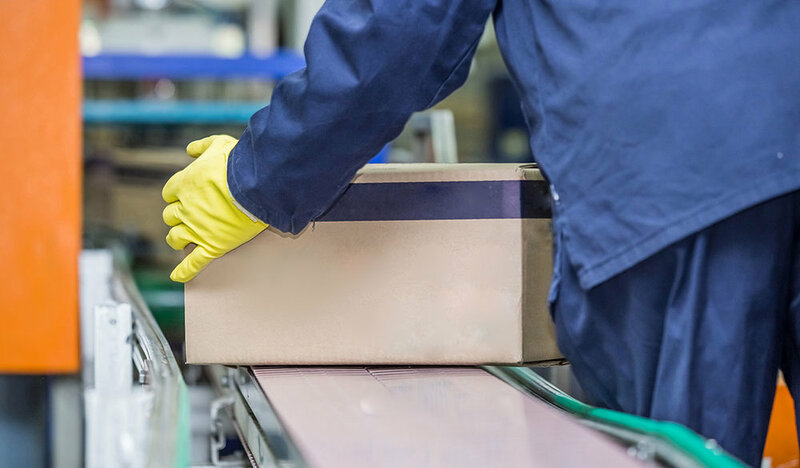 Dimensional weight also helps retailers choose the right box to ship their goods. They’re able to reduce shipping costs by using boxes with dimensions within the minimum requirements of the product. These minimum requirements should take into consideration extra-stuffing or bubble wraps for fragile items. Large freight companies use weighing machines mounted on top of a conveyor to calculate the total DIM weight of your packages automatically. Sometimes these machines are equipped with speed-based tachometers to determine the length of a box as it rolls over the conveyor belt. Once the weight and length of the box is calculated, it’s passed through a laser scanner which determines its exact height and width. Finally, all these measurements are entered into a computer which calculates the total DIM weight of the package. These systems are capable of taking precise measurements of a package. For instance, when calculating the length of a package, the machine will measure the exact distance between the two furthest endpoints. Similarly, while calculating the width of the package, any slight deformity or bulge in its shape will be accounted for in the measurement. Determine the length, width, and height of the package using the highest point on each side. Account for any deformities or bulges in the shape of the package in the measurements. It’s important to note that unrecorded irregularities in measurements can result in higher handling fees. Most freight carriers require you to round up each measurement to the nearest whole number. For instance, 13.98 inches will be rounded up to 14 inches. Next, determine the cubic size of the package by multiplying its length, width, and height. For example, if your package dimensions are 20 inches x 15 inches x 13 inches, your package size will be 3,900 cubic inches. Lastly, divide the volume size of the package by a DIM factor to determine its dimensional weight. Large freight carriers use dimensional factors to calculate the shipping fees of lightweight, bulky packages. DIM factor represents volume inches per pound of weight. FedEx currently uses 139 cubic inches per pound as the DIM factor for both domestic and overseas shipments. Following our example, we’ll divide the cubic size of the package i.e., 3,900 by 139 to get 28 pounds. If the actual (scale) weight of your package is less than the DIM weight, the freight carrier will bill you on the basis of the DIM weight since it’s higher. And if the actual scale weight is more than the DIM weight, they will charge you a shipping fee on the basis of the actual weight. Scenario 1: Actual weight = 30 lbs; DIM weight = 28 lbs; Pricing will be based on the actual weight. Scenario 2: Actual weight = 26 lbs; DIM weight = 28 lbs; Pricing will be based on the DIM weight. To sum up, dimensional weight pricing is a technique used by large shipping companies to weigh a package based on its size rather than its actual weight. So, if you are shipping lightweight but bulky packages (for instance, packages containing lampshades, pillows, or stuffed toys) you can expect to be charged a higher shipping fee if the freight carrier uses DIM weight pricing.